Biomedical engineering is considered to be the most expansive of all the engineering sciences. Its function involves the direct combination of core engineering sciences as well as knowledge of nonengineering disciplines such as biology and medicine. 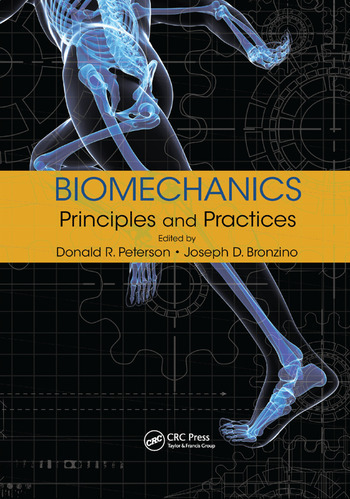 Drawing on material from the biomechanics section of The Biomedical Engineering Handbook, Fourth Edition and utilizing the expert knowledge of respected published scientists in the application and research of biomechanics, Biomechanics: Principles and Practices discusses the latest principles and applications of biomechanics and outlines major research topics in the field. This book contains a total of 20 chapters. The first group of chapters explores musculoskeletal mechanics and includes hard and soft-tissue mechanics, joint mechanics, and applications related to human function. The next group of chapters covers biofluid mechanics and includes a wide range of circulatory dynamics, such as blood vessel and blood cell mechanics and transport. The following group of chapters introduces the mechanical functions and significance of the human ear, including information on inner ear hair cell mechanics. The remaining chapters introduce performance characteristics of the human body system during exercise and exertion. Biomechanics: Principles and Practices functions as a reference for the practicing professional as well as an introduction for the bioengineering graduate student with a focus in biomechanics, biodynamics, human performance engineering, and human factors. Joseph D. Bronzino is currently the president of the Biomedical Engineering Alliance and Consortium (BEACON; www.beaconalliance.org). Dr. Bronzino earned a BSEE from Worcester Polytechnic Institute, Worcester, Massachusetts, in 1959, an MSEE from the Naval Postgraduate School, Monterey, California, in 1961, and a PhD in electrical engineering from Worcester Polytechnic Institute in 1968. He was recently the Vernon Roosa Professor of Applied Science and Endowed Chair at Trinity College, Hartford, Connecticut. He is the author of over 200 articles and 11 books, including The Biomedical Engineering Handbook (CRC Press, 1st ed., 1995; 2nd ed., 2000; 3rd ed., 2005). Donald R. Peterson is a professor of engineering and the dean of the College of Science, Technology, Engineering, Mathematics, and Nursing at Texas A&M University in Texarkana, Texas. He holds a joint appointment in the Department of Biomedical Engineering at Texas A&M University in College Station, Texas. He earned a BS in aerospace engineering and a BS in biomechanical engineering from Worcester Polytechnic Institute, Worcester, Massachusetts, in 1992, a MS in Mechanical Engineering from the UConn, Storrs, Connecticut, in 1995, and a PhD in biomedical engineering from UConn in 1999. He has written for numerous publications, and is the co-editor-in-chief for The Biomedical Engineering Handbook by CRC Press.